by placing his forearms firm on the edge of the table ... "
This is what I enjoy about the poetry of Ted Kooser. In the opening lines of the poem "Splitting an Order" in his new collection Splitting an Order, he describes something ordinary in an extraordinary way. He sees the ways hands move and what is in the sandwich. He shows how the sharing of a meal is a ritual. If you or I were in a restaurant across from an older couple sharing a sandwich, we would pay no attention to them, not seeing the clues to their lives in plain sight. Kooser is different. out in the cold, wet rocks, ... "
Kooser is a painter, as he tells us here in the autobiographical poem "A Person of a Limited Palette" and later in the grief-filled essay "Small Rooms in Time." He notices details and reproduces them precisely in verse. Paging through his collection is like walking through an art gallery with a variety of portraits and landscapes. You may linger in front of some of them today and others next time you visit. Kooser's poems in Splitting an Order are the work of an older man. He features his contemporaries in some of the poems, often with a middle aged child, but he also writes about young couples and children, as he does in "Swinging from Parents." I think my favorite in the collection is a poem about his father called "Closing the Windows." not so ordinary at all." When I return to the library books of poetry after only reading four or five poems, I wonder if I like the idea of reading poetry more than actually reading of poetry. Ted Kooser refutes this notion. 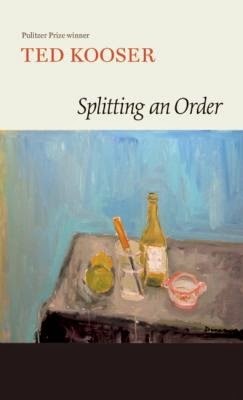 I liked the poems of Splitting an Order so well that I read the collection twice. They are worth getting to know. I might return to them again, as I do to galleries of art. Kooser, Ted. Splitting an Order. Copper Canyon Press, 2014. 84p. ISBN 9781556594694.